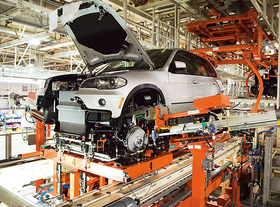 Building cars at its US plant in Spartanburg, South Carolina, protects BMW against fluctuations in the euro-dollar exchange rate. MUNICH -- As if a global recession isnt worrying enough for Europes automakers, sharp fluctuations in currency exchange rates are sharpening the blow. European carmakers with exposure to the dollar are especially vulnerable to exchange-rate swings, said Garel Rhys, emeritus professor of motor industry economics at Cardiff Business School in Wales. The German carmakers are particularly at risk [because of the weak dollar], so they try to hedge to an extent by having some production elsewhere, he told Automotive News Europe. The US is the biggest single sales market for Mercedes-Benz and BMW, as well as for Volvo. Although the dollar has strengthened somewhat, to $1.28 to the euro last week, from $1.60 last summer, it still is weak compared with the 2002 exchange rate of 85 cents. A weak dollar makes it harder for foreign carmakers to price their cars competitively and profitably in the US. Plus, anyone who hedged the dollar when the euro was at its peak could be in for a financial hit should the dollar remain strong until their hedges expire. In 2007, it was 517 million. Schmidt added that BMW has used the current strength of the US dollar to improve its hedging quota for 2009. Hedging a currency locks in a specific exchange rate, which can help a business to avoid fluctuations. It is similar to a futures contract, except the raw material is currency, rather than oil or oranges. Not that a hedge is a guarantee. If the exchange rate goes up during the period of the contract, the business only has to pay the lesser agreed-upon price. However, if the rate falls it can prove costly, and mean paying too high a price for a weak currency. To avoid this, some companies hedge currencies in both directions. If youve got big exposures to lots of currencies, then you probably want to hedge against them, said Philip Wylie, director of investment banking firm Houlihan Lokey in London. Carmakers also increase purchasing volume in those markets. Thomas Klier, an economist with the US Federal Reserve Bank of Chicago, said about 25 percent of motor vehicle parts used in production in the US are imported. Another 25 percent of parts are produced in the US by foreign-based partsmakers. However, companies can go too far with their hedging strategy, warns Jürgen Pieper, head of research at Metzler Equities in Frankfurt. For smaller brands that cannot afford the expense of an overseas assembly plant, hedging is the main solution. Audi takes the hedging approach, particularly in relation to the US dollar, British pound, Canadian dollar and Japanese yen. Similarly, Porsche makes its cars in Germany, but its biggest markets are the US, Asia and Russia. Härter added that Porsches position is that the current dollar strength is a temporary phenomenon, and that Porsche has established currency hedges against the British pound and Japanese yen for up to four years. The British pound has been struggling lately, and fell to a 23-year low against the dollar in January. That weakness can actually help an automaker like UK-based Jaguar, because a vehicle sale in a market with a stronger currency means higher profits when converted back into pounds, Rhys said. Volvo also claims it is able to use currency fluctuations to its advantage. Spokeswoman Maria Bohlin said the US dollar was working well for them before Christmas 2008. But Bohlin added that the dollar has to remain strong for some time before Volvo can see any long-term gain. Whats more, as Volvo mostly sources parts in the pricey Eurozone, but sells many vehicles overseas, it has to make the tough choice between keeping its cars price-competitive or making a profit.